The term compound interest most often refers to the benefits of investing and gains achieved when you set aside money for future needs. Illustrations are designed to show you how the money will grow faster if you leave it in an account, including reinvesting all interest or gains. The longer it is left, the better off you will be at some point in the future. Unfortunately, if you carry debt, this same phenomenon of compound interest is working against you, instead of for you. 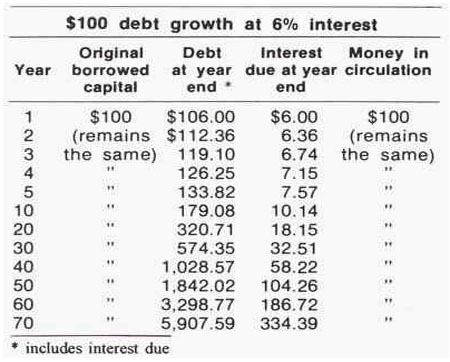 Debt payments accumulate interest, and interest charged on interest creates a compounding effect based on the same principles seen in investments. When you are investing, you are gaining the benefit and when you are borrowing you are paying the higher price. Loans express interest charges in terms of an interest rate and an interest yield. The rate is the amount listed on the contract, and most often what you think of when you consider how much you will pay for the debt. The yield is the effective rate you actually pay once compounding takes effect. 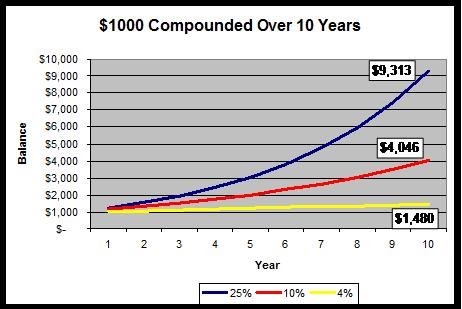 The following graph illustrates this point based on annual compounding. If you borrow $100.00 and at the end of the first year, you will owe $6.00 in interest. The unpaid interest adds to the principle balance, and now you owe $106.00. At the end of year two, $6.36 cents is added to the principal balance, and the debt has grown to $112.36. This interest continues to grow exponentially until debt payments are complete. While you may think $6.00 is not a lot to pay, when considering balances upwards of $40,000 or $50,000, then the interest adds up much more quickly and becomes meaningful almost immediately. 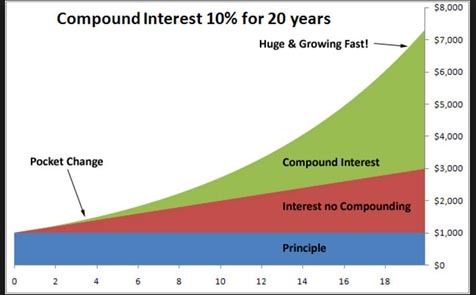 The higher the interest rate, the more compounding will impact the end result. This graph illustrates the impact, over the same period of time, an interest rate can make. At a growth rate of 4%, the balance only grows to $1,480 over a 10-year period. Raise the interest rate to 10%, and over the same period, the growth now totals $4,046. If a rate of 25% is charged, much like credit card penalty rates, the number grows to over $9,000 over the same 10-year time period. This example illustrates why default rates make it nearly impossible to bail yourself out of debt. 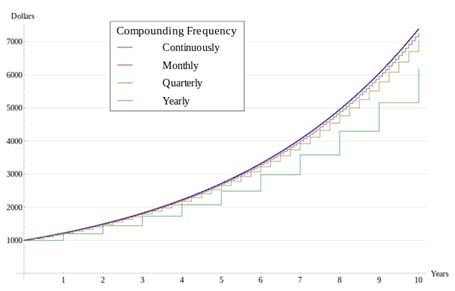 The compounding effect is powerful, and may result in paying multiples of the original principle balance. In this example, you begin with $1,000 and could end up paying over $9,000, just based on the interest rate. The graph also illustrates why paying the minimum balance will result in taking 30 plus years to pay off high credit card balances. You will also notice in the first few years; the total payments are not that much different. Accelerating payoffs shorten the time interest is charged and reduces the overall amount you are paying on the debt. The frequency of compounding significantly impacts interest growth on an account. Most investment accounts compound either monthly or annually. Credit cards, on the other hand, tend to compound interest daily. Meaning that each day a balance is on the account, interest charges add to the principal balance for the next day’s interest calculation. The higher the compounding frequency, the more money you end up paying on the debt. The formula for compound interest is pretty straight forward, which makes it appear easy to calculate. It is: Interest = Principle X Rate X Time. These are the three elements that determine interest charges on any debt. In addition to the high-frequency interest compounded on credit card debt, the impact on student loans is also significant because of the way the debt is structured. Student loan debt begins while you are in school. At the start of each semester, funds are released to the student, and interest begins to accumulate immediately. Each year the balance grows due to compounding unless you make interest payments. Subsidized loans have the benefit of the government paying the interest while you are in school, but that stops once you begin repayment. Unsubsidized loans offer the option to make interest payments each month, to reduce the impact of compounding, although very few students take advantage of this feature. Upon completion of school, the loan enters the repayment period where interest continues to build, but payments begin to reduce balances. Deferments, Forbearances and other delays in repayment result in interest growth while payments are on hold, raising the total amount of debt due. Moving to an income-based option and spreading payments over a longer period of time will grow the balances exponentially, resulting in much higher overall debt payments. The compounding effect can result in paying double the initial balances when payments are extended to the maximum of 25 years, even though the interest rate is low. Illustrated in the graph below is the impact oof compounding credit card interest. As you can see the more frequently debt is compounded, the faster the balances rise. Daily or continuous compounding results in the highest possible amount paid for the debt. Interest calculation is tabulated by breaking down the annual rate to a daily rate. Interest is added to the balance every day, and the total is posted to the account monthly. For example, a 15% annual rate translates to a 0.041% daily rate. Large balances carried for any length of time will see exponential growth due to the interest calculations, making it more difficult to pay off the debt. The length of time the debt Is outstanding is the last factor in compound interest that accounts for high rates of balance growth. The longer the debt is owed, the more you pay in interest. A credit card statement now lists a minimum payment and the payment required for a three-year payoff. The difference is typically only a small amount more than the minimum due but can save you thousands in interest over the life of the debt. The following graph shows the impact of $1,000 in principle, over a 20-year period of time. Simple interest, without the effect of compounding, raises the balance to $3,000, where compounded interest ups the ante to over $7,000. That is more than twice the interest payments than simple interest charge. Understanding interest calculations can help you use debt wisely. Know the rate you are borrowing money at, determine how long it will take to pay off the debt, and how often interest is compounded. Doing so can save you thousands of dollars in interest payments and will lead to stronger financial decisions when it comes to debt management.